Silver Spring, Md. (Tuesday, October 2, 2018) – Stanley Black & Decker, the world's largest tools and storage company and leader in engineered fastening and security, and Discovery Education, the leading provider of digital content and professional development for K-12 classrooms, today launched Innovation Generation: Making an Impact. This brand-new movement aims to inspire educators and students in grades 6-10 to empower the maker spirit within us all. 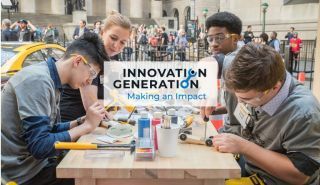 In celebration of Stanley Black & Decker’s 175 anniversary – and to celebrate the company’s inaugural Maker Month – Innovation Generation: Making an Impact is designed to engage and empower student makers in classrooms nationwide. The Innovation Generation Contest invites communities to vote daily for the school of their choice to have a chance at winning its very own Stanley Black & Decker Makerspace! The company will award two $25,000 grand prizes that can be used toward the tools, services and equipment needed to create a state-of-the-art space for making, creating, innovating and tinkering in two lucky schools. Eligible schools can visit www.innovation-gen.com to learn more. Contest voting closes on March 5, 2019 and two schools will be awarded prizes purposed to foster a spirit of learning, ingenuity and growth. Overall, the initiative aims to cultivate student collaboration and Science, Technology, Engineering, Art and Math (STEAM) learning acceleration in urban, rural, advanced and underserved learning communities. Powered by Stanley Black & Decker’s tools, with powerful brands such as DEWALT, CRAFTSMAN, STANLEY, IRWIN and BLACK+DECKER, together with Discovery Education’s unparalleled classroom reach, Innovation Generation: Making an Impact will fuel student learning with a premiere, STEAM-focused, cross-disciplinary initiative that invites students and educators to explore their worlds through building, making and doing. Alongside Stanley Black & Decker experts, Innovation Generation will provide students with opportunities to learn about diverse STEAM careers in context – connecting them with examples of real-world applications. Exploring direct connections to vocational STEAM, young innovators will engage in virtual field trips, maker activities and a national student contest that represents the innovation continuum. This will ensure that students are exposed first-hand to how math, science, technology, creativity and teamwork can lead to technological advancements in our everyday lives. Positioned to inspire an inclusive maker culture in classrooms and communities, Stanley Black & Decker’s commitment to empower the next-generation of innovators is focused on helping today’s youth develop the skills necessary to compete in this dynamic landscape. Throughout the month of October, Stanley Black & Decker will celebrate Maker Month – a celebration of the makers and creators shaping the world around us – inviting students, parents, school communities and makers of all ages to participate in activities and challenges that spark curiosity and build excitement for the power of making. Stanley Black & Decker employees around the world will partner with local schools and organizations to lend their time and skills to lead Maker Month activities. Innovation Generation: Making an Impact complements Stanley Black & Decker’s existing maker-focused efforts – including Makerspace collaboration initiatives with universities and other organizations, global apprenticeship programs, sponsorship of WorldSkills International, and the company's recent announcement of its Manufactory 4.0 initiative that includes job retraining efforts and the STANLEY+Techstars Additive Manufacturing Accelerator program. Resources are available at www.innovation-gen.com and will become available through Discovery Education Streaming. For more information about Discovery Education’s digital content and professional development services, visit discoveryeducation.com. Stay connected with Discovery Education on Facebook, Twitter, Instagram and Pinterest @DiscoveryEd. Stanley Black & Decker is a $13 billion revenue, $20+ billion market capitalization, purpose-driven industrial organization. Stanley Black & Decker has 58,000 employees in more than 60 countries and operates the world’s largest tools and storage business, the world’s second largest commercial electronic security company, a leading engineered fastening business as well as Oil & Gas and Infrastructure businesses. The company’s iconic brands include BLACK+DECKER, Bostitch, CRAFTSMAN, DEWALT, FACOM, Irwin, Lenox, Porter Cable and Stanley. Stanley Black & Decker is a company for the makers and innovators, the craftsmen and the caregivers, and those doing the hard work to make the world a better place. Learn more at stanleyblackanddecker.com.